A man has been fatally shot in the head near a busy junction near Central Park in Manhattan, New York City. The shooting happened shortly before 14:00 EST (19:00 GMT), when an unidentified man opened fire at the corner of 58th Street and 7th Avenue. The gunman fled by jumping into the passenger seat of a waiting vehicle that drove away, US media reports said. Officials say Lincoln Woodard, 31, was taken to St Luke's-Roosevelt Hospital, where he was pronounced dead. The victim was from Los Angeles, but police gave few more details. The shooting took place in a busy area of Manhattan not known for shootings or crime, and opposite a boy's boarding school, Saint Thomas Choir School. None of the pupils witnessed the shooting because they were at a church, a school receptionist told the Associated Press news agency. The street is close to Central Park and high-profile shops, as well as the Time Warner building, home of CNN's New York studios. Multiple reports said the suspect was wearing a jacket with a dark hood. "It looked like it was an intended target," said Paul Browne, the NYPD's chief spokesman, told New York website DNAinfo, adding the gunman did not steal anything from the victim. 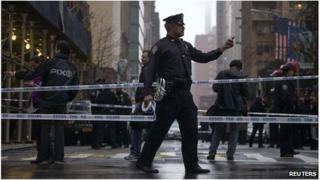 Rickshaw driver Sedat Kolo, 36, told the New York Times he saw the shooting and went to the victim after he fell. "I heard the shot, I looked and saw the guy fall down," he said. "I told him, 'Hang on, breathe easy,'" Mr Kolo said. "He was trying to say something, but blood kept coming out of his mouth. There was blood all over. Then he lost consciousness." It is believed that the shooter and getaway driver may have been waiting in the area for some time. They escaped in a light grey or silver Lincoln sedan. A local NBC News channel reported that the entire incident was recorded on surveillance video.